The commander of the Iranian Revolutionary Guards Corps (IRGC) Quds Force is in Iraq as an adviser at the request of the government in Baghdad, Iraq’s foreign minister said on June 6. Maj. Gen. Qassem Soleimani is assisting Iraqi forces in the fight against Islamic State of Iraq and Levant (ISIL), according to Iraqi Foreign Minister Ibrahim al-Jaafari. 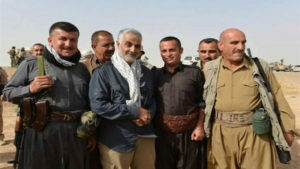 Image of Maj. Gen. Qassem Suleimani, grey hair and beard, purportedly shows him on an Iraqi battlefield. /IRINN state television. “The presence of Iran’s military advisers under the command of Maj. Gen. Qassem Soleimani in Iraq comes at the request of the legitimate government of Iraq for confronting the terrorists and extremists causing instability and insecurity in the Arab country and the region,” Foreign Ministry spokesman Hossein Jaberi Ansari added. The comments were in response to Saudi Foreign Minister Adel al-Jubeir’s recent accusations that Iran’s military leaders are interfering in the internal affairs of other countries in the Middle East. “In order to recognize its own interests, friends and enemies, the Iraqi nation does not need statements by the foreign minister of a country that has been the biggest factor of instability and a sponsor of terrorism in Iraq, the region and the world in the past decade and a half,” Ansari said. A Wall Street Journal report said that Soleimani is in close contact with the anti-American commander of the Iran-backed Shi’ite militia movement taking part in the offensive to retake Fallujah from ISIL. Jamal Jaafar Ibrahimi, primarily known as Abu Mahdi al-Mohandes, commands the Popular Mobilization Forces (PMF) and is said to be Soleimani’s right-hand man in Iraq.